It is often mistakenly assumed that statistical approaches such as the Direct Interaction Approximation or EDQNM cannot predict anything on structure related issues since all phase-information is averaged out. However, structures are a dynamical consequence of the underlying equations and the statistical theories are derived from these equations. It is therefore not completely surprising that, if the assumptions used in deriving the closures are physically sound, the statistics observed from closures can be related to the structures observed in experiments and simulations. Indeed, we have shown that using statistical closures, we can measure related to the coherence of a flow. This measure is the depletion of nonlinearity. Both in 2D and 3D, and also in passive scalar turbulence, we can hereby probe the statistical imprint of coherence on a turbulent flow. Below we show the mean-square nonlinearity in a simulation of decaying 2D turbulence, compared to a Gaussian reference field. This ratio drops rapidly to a value of 40% when vortices form and evolves slowly towards an almost complete depletion at long times (PhD Andrey Pushkarev). Depletion of nonlinearity in a simulation of 2D turbulence. Top : zoom on the short time evolution. Bos WJT, Fang L. Dependence of turbulent advection on the Lagrangian correlation time. Phys. Rev. E. 2015;91:043020. Pushkarev A, Bos WJT. 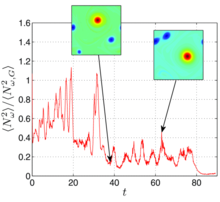 Depletion of nonlinearity in two-dimensional turbulence. Phys. Fluids. 2014;26:115102. Bos WJT, Rubinstein R. On the strength of the nonlinearity in isotropic turbulence. J. Fluid Mech.. 2013;733:158–170. Bos WJT, Rubinstein R, Fang L. Reduction of mean-square advection in turbulent passive scalar mixing. Phys. Fluids. 2012;24:075104.